If privacy and comfort in a quintessential Maine seacoast setting is what you are looking for, then this is the place for you. A three bedroom, 2 ½ bath unit which is ½ of the first floor and the entire second floor of a two unit Cape Cod style building, with extraordinary water views. There is also plenty of room outside to play and relax. The view out the front door is York Harbor and the Atlantic Ocean. You might be tempted to prepare all of your meals in the large, fully equipped kitchen, but you don’t have to as the Dockside Restaurant is only a short walk away. The Deck at Dockside is the second dining option on site, a casual deck offering great food and drinks overlooking York Harbor. •Large fully equipped kitchen with center island, granite counter tops, new appliances, dishes, pots, pans, utensils and cutlery. •Master bedroom – full bath, king bed and water view. To help you take full advantage of our waterfront location use of our 13' Boston Whaler outboard motor boat is included! Must be qualified to operate this boat. A guest recently sent us this note: "We have been staying with you for several years now and always look forward to returning. The unmatched location, the comfortable accommodations with magnificent views, the very helpful and pleasant staff all are responsible for this. There is a lovely quality about the Dockside which reflects “old Maine” and we hope that never changes. It is comforting to return and find things as they were the last time we were there. So many places make drastic changes which often ruin their original true Maine character so we are always glad you haven’t done that. In this hectic and quickly changing world, it is nice to find some place upon which to depend. So as always, we had a great time and look forward to our next stay with you." The Captain's Quarters is a part of the Dockside Guest Quarters, a 25 room inn. There is also an excellent restaurant and bar on site as well - Dockside Restaurant and The Deck. This beautiful facility occupies Harris Island in York Harbor with water views from every direction. Southern coastal Maine is truly a special place. The Captain's Quarters is uniquely located so that you can take advantage of all our area has to offer. A well appointed home with large lawns overlooking the ocean. Hard to ask for more. In addition there are two restaurants on site. Also, a full time staff to assist you with planning your time here or should you require assistance of any kind. You have the privacy and independence of a house yet the support and amenities of our small resort. Escape from the hustle and bustle of everyday life at our waterfront cottage overlooking York Harbor and the ocean beyond. Our beautiful home is conveniently located and features unobstructed water views. Relax in comfort on our large property or take our 13' Boston Whaler outboard motorboat out for a ride on the gorgeous harbor waters (prior training necessary to operate). Prepare a meal for yourself in the full sized kitchen area or stop into either of the two on property dining options - the Dockside Restaurant or The Deck for delicious food and breathtaking views. Captain's Quarters overlooks the harbor channel leading to the ocean. Enjoy unobstructed views of the York Harbor and ocean beyond. The Captain's Quarters is part of the Dockside complex; inn, restaurant and marina. This very private two unit building features breathtaking views of the harbor channel leading to the ocean. Captain's Quarters has unobstructed views of York Harbor and the ocean beyond. Captain's Quarters overlooks York Harbor and the ocean beyond. Ample parking adjacent to the unit. All towels are provided as well as beach towels. One flat screen in the living room and one in the master bedroom. Large front and back lawn. Front lawn looks directly out to the water. Free use of our 13' Boston Whaler outboard boat (must meet qualifications). Great boat for trips up the York River, cruising around the harbor or checking out the harbor entrance. Large porch overlooking the water. Deck chairs, table and umbrella make this THE spot to watch all of the harbor activity and the beautiful view. Large porch across front of the house looking directly out the harbor channel to the ocean. All the boats coming and going from York Harbor will pass right in front of you! Quite and private, great location, great views. We did a four week rental at the Dockside-Captain's Quarters and had a truly enjoyable time. The house is quiet and private and has great views of the ocean and harbor entrance. Dockside is a great location for exploring the south coast of Maine. York Harbor is a lovely village with beautiful homes, great restaurants and bars, and Ogunquit and Kennebunkport are a short drive away. This is a large, three bedroom house suitable for a family or a couple of close friends. The innkeepers, Eric and Carol, and their staff, are all very friendly and accommodating. Dockside provides a really nice marina and a very good restaurant. While the Captain's Quarters has a wonderful, large deck, I would recommend taking the time to go up to the Maine House and sit out on the front porch. I have found few things more relaxing and enjoyable than sitting on this porch in the afternoon [with a tall rum drink] and watching the boats coming and going from the harbor. If you are looking for a large house on coast of Maine with a great location and great views, then this is the place. Our stay was a memorable stay in a beautiful house overlooking the bay. It had all the amenities one could want, very comfortable and clean . My wife and I discovered the Dockside in the late 90's and enjoyed escaping there even in the late fall, for some rooms not only have great views but fireplaces as well. Once my wife passed, my family started sharing the Dockside and the Captain's Quarters, which has room enough for our nine. With three sleeping quarters, my two children's families each have a room of their own, and I get to escape to a wonderful master bedroom. We love the place so much that this year my daughter's family flew in from Texas and my son's drove in from Western New York. Eric, Carol, and their staff make the Dockside a perfect family escape, and you couldn't ask for more family friendly accommodations than the Captain's Quarters. We only wish we could come more often. Finding the perfect vacation spot for a family of 15 isn't easy, however, the Captain's Quarters at Dockside is the perfect solution. We have been renting the Captain's Quarters along with the adjoining suites for many years. The view is breathtaking, the accommodations are inviting, comfortable and clean. The privacy offered in that particular setting is unparalleled and the lawn and surrounding grounds offer so much for our children & grandchildren. 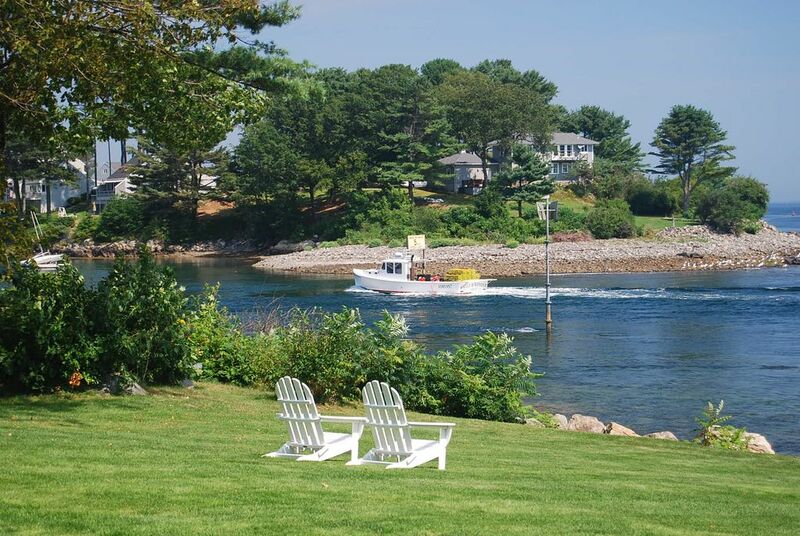 The innkeepers are perfect hosts and are always available to answer questions and provide local information, as well as great stories about living on the coast of Maine. If you choose the breakfast package, the homemade muffins, quiche, fruit etc are delicious and eating on the grand porch of the main house offers phenomenal views of the York River and harbor. Eating in is easy as the kitchen has everything needed for preparing casual family dining including an outdoor grill. Enjoy falling asleep to the sound of the changing tides and awaken to a gorgeous sunrise! A perfect family vacation! A Fabulous Place for Family Vacation! We rented the Captains Quarters for an intergenerational vacation of grandparents, parents and children. What a Find! Ample space(3 bedrooms) with a stunningly gorgeous view of the river. The Quarters were nicely furnished with a full kitchen and cooking equipment and a washer dryer. No need to go out for meals unless you want to. Also an outdoor grill for cookouts. We took advantage of their boat rental for a wonderful day. Eric was terrific suggesting where to go on the river and ocean. They also provided beach chairs. Badmitten and shuffleboard for the kids. Kayaking available in walking distance. Beach a short drive. Our one week vacation last year was so successful that we reserved for two weeks this summer! Dockside is a great place; its pictures don't do it justice. The setting, with its water views, is outstanding. The location is peaceful and quiet, yet it is close to many activities. The rooms are well appointed and clean, and the food at both the Inn breakfast and the onsite restaurant is excellent. The staff is very friendly and helpful. My wife and I have stayed at Dockside the last two years (just the two of us) and were joined this year for part of the stay by our immediate family (all 19 of us). Dockside worked for us for both the large group and as a couple. The larger group enjoyed activities such as the nearby beaches, sightseeing, kayaking and especially some competitive shuffleboard games onsite. The Captain's Quarters served very well as a gathering spot for family dinners and games. The BBQ grill was a little rickety, but the staff quickly repaired it for our use. The Inn breakfast also served as an impromptu gathering place for family chats. My 7 year old granddaughter best summed up our feelings about Dockside when, on departure morning, she said to me " Papa, I don't want to leave this place". views of York Harbor and the ocean. Yet we are only 2 hours away from the White Mountains in NH, 1.5 hrs from Boston and 1 hr away from Portland, ME. This central location is ideal for taking advantage of all the areas offerings, yet there is plenty to do near by or on site. There are four beaches in York, antique shopping, nature walks, fishing, golf, lighthouses, whale watching and of course many fishing opportunities. The famous Kittery Outlets are nearby. Truly in the center of a great area!